Glenda Collens Sings for Bernard & Michael on the occasion of their "Bachelors No More" evening for invited guests prior to their wedding. Eastern Performing Arts Fraternity presents DIVAS Live featuring Glenda Collens, Kay Alleyne, Lilian Lopez and Inge Schluer in concert. 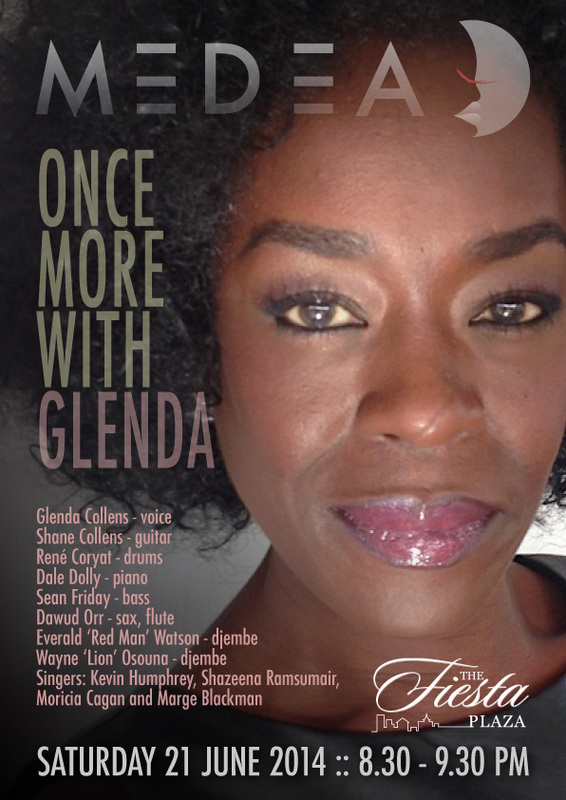 Glenda Collens 'Once More', a repeat performance at The Courtyard, Fiesta Plaza, Movietowne accompanied by Shane Collens (guitar), Rene Coryat (drums), Dale Dolly (piano), Sean Friday (bass), Dawud Orr (sax, flute), Wayne "Lion" Osouna (djembe) and Everald 'Red Man' Watson (djembe) with guest singer performers: Kevin Humphrey, Shazeena Ramsumair, Moricia Cagan and Marge Blackman. Glenda Collens returns to the The Courtyard, Fiesta Plaza, Movietowne accompanied by Shane Collens (bass), Rene Coryat (drums), Dale Dolly (piano), Dawud Orr (sax, flute) and Everald 'Red Man' Watson (djembe) with guest singer performers: Kevin Humphrey, Shazeena Ramsumair and Moricia Cagan. 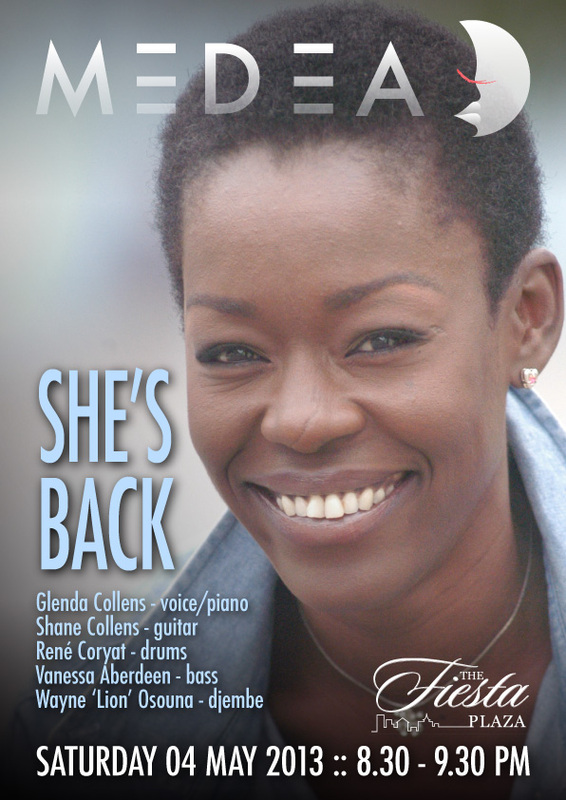 This will be Glenda's sixth year in a row performing during this season at Fiesta plaza. This is also one of the few gigs that we do every year where you can bring the family - a courtyard restaurant setting - and it is free. MINE Promotions present a fundraiser concert and event for Fathers in support of WeCare Deaf Support Network to acquire a sign language interpreter for deaf studens at Sangre Grande, Servol Life Centre. 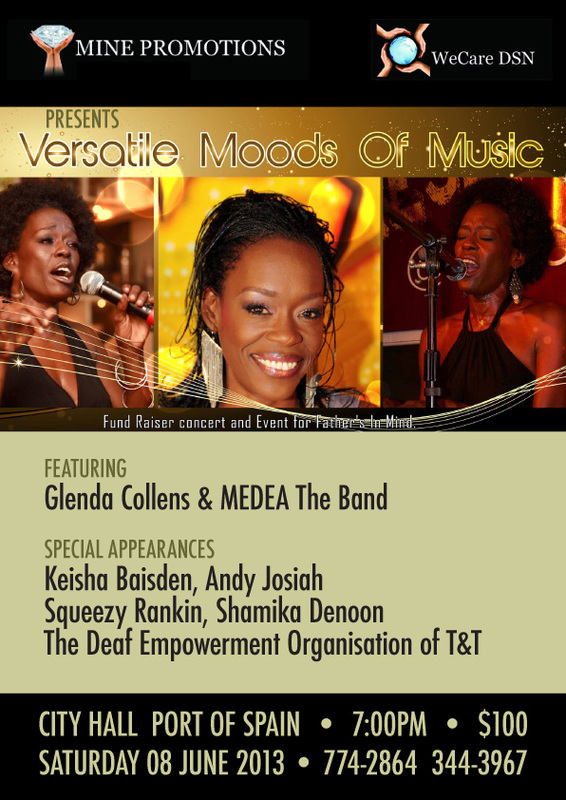 Glenda Collens will close the show with her band MEDEA featuring, Shane Collens (guitar), Rene Coryat (drums), Vanessa Aberdeen (bass), Dale Dolly (piano), Wayne "Lion" Osouna (djembe), Everald 'Redman' Watson and the MEDEA Voices: Kevin Humphrey, Deon Baptiste, Ian Baptiste. Glenda Collens @ Raf Robertson's Majesty Live! Glenda Collens & MEDEA return to the The Courtyard, Fiesta Plaza, Movietowne with more original music and their unique sound of funk 'n' soul, jazz 'n' rock classics. 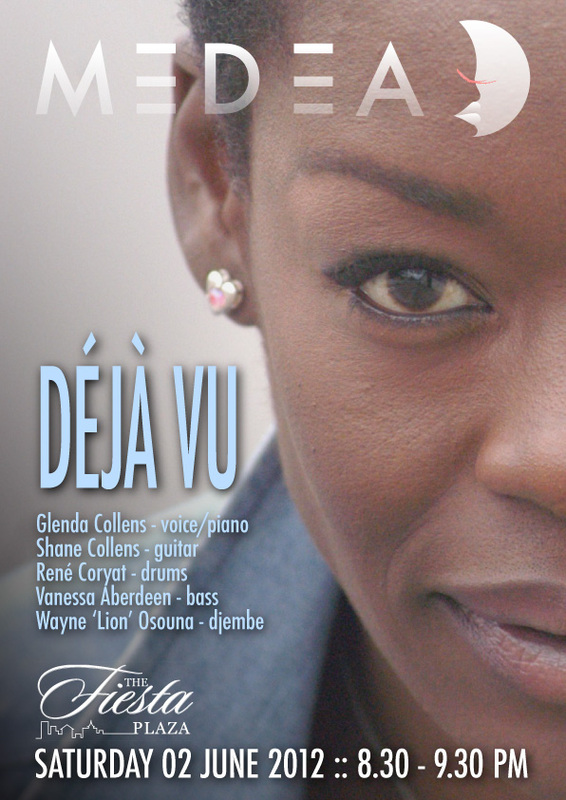 Glenda Collens (vocals/piano), Shane Collens (guitar), Rene Coryat (drums), Vanessa Aberdeen (bass), Dale Dolly (piano), Wayne "Lion" Osouna (djembe), Everald 'Redman' Watson and the MEDEA Voices: Kevin Humphrey, Deon Baptiste, Ian Baptiste, Gerelle Forbes and special guest Shazeena Ramsumair. This will be Glenda's fifth year in a row performing during this season at Fiesta plaza. This is also one of the few gigs that we do every year where you can bring the family - a courtyard restaurant setting - and it is free. Glenda Collens @ The 3Canal Show 2013 "PLANASS"
Glenda Collens directs and arranges a 30 voice "Celestial Choir of Rapso Warrior Angels" backing choir for the 3Canal Show 2013 "PLANASS". 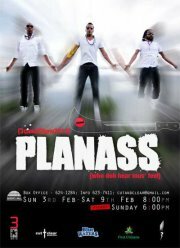 Featuring Wendell Manwarren, Roger Roberts and Stanton Kewley with their band "cut + clear crew". Also performing are Cecilia Salazar, Penelope Spencer, Arnold Goindhan and Conrad Parris. 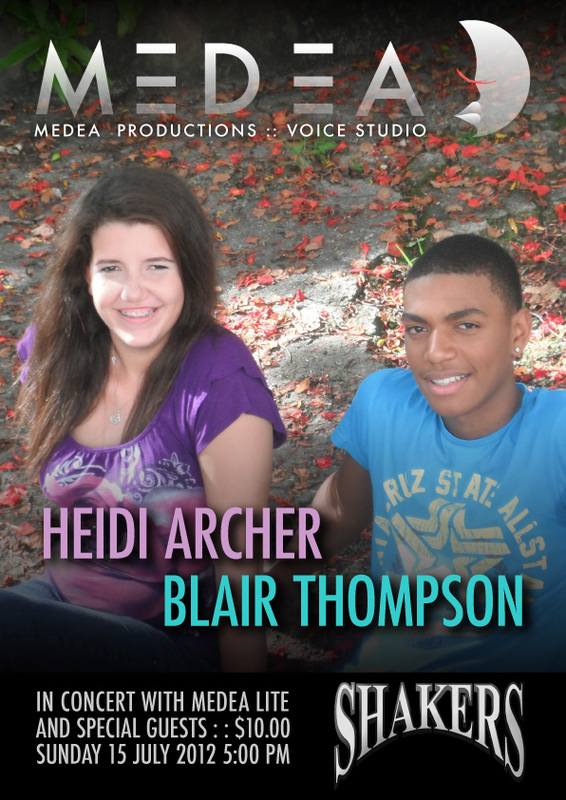 MEDEA Productions in association with Shakers on the Avenue present Heidi Archer and Blair Thompson in concert accompanied by the band, MEDEA Lite, and with other students from the MEDEA Voice Studio as special guest artists. 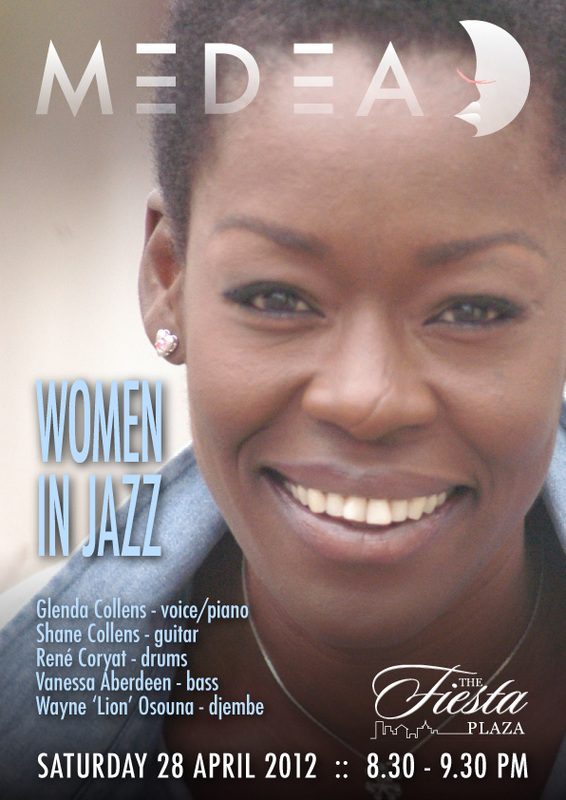 MEDEA Lite is Rene Coryat (drums), Vanessa Aberdeen (bass), Mical Williams (guitar) and more. 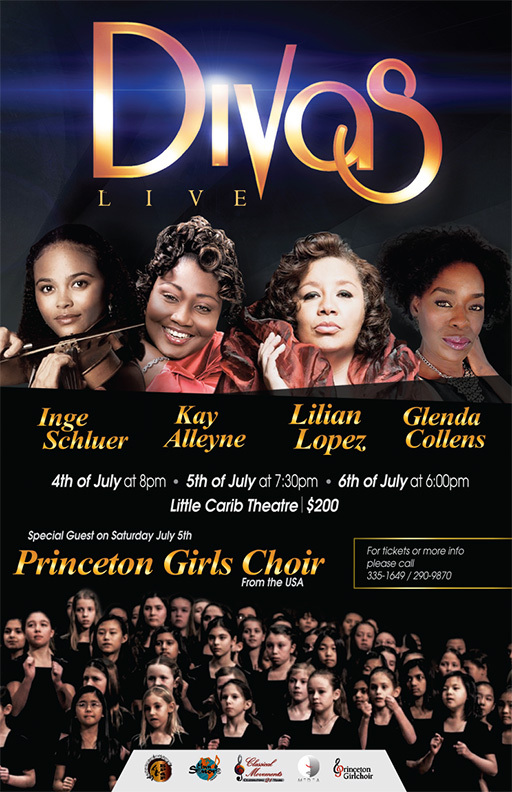 Supporting guest artists: Kayode Salina (voice), Tracey Lucas (voice), Mandisa Granderson (voice), Nickolai Salcedo (guitar/voice). "With The Funk". 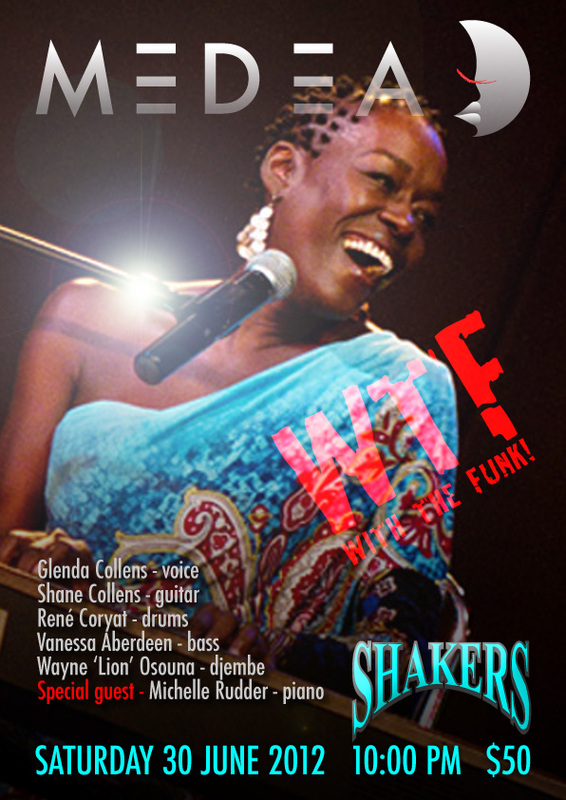 Glenda Collens and MEDEA return to Shakers on the Avenue with more original music as well as their unique sound of funk 'n' soul, jazz 'n' rock classics. 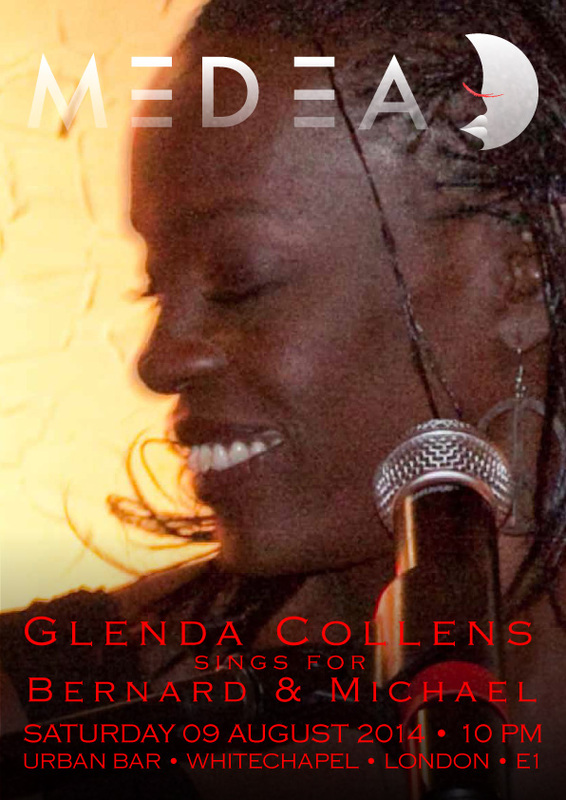 MEDEA The Band will be Glenda Collens (vocals/piano), Shane Collens (guitar), Rene Coryat (drums), Vanessa Aberdeen (bass) and Wayne "Lion" Osouna (djembe). Its "Déjà Vu" with Glenda Collens at the The Courtyard, Fiesta Plaza, Movietowne accompanied by her band MEDEA with more original music as well as their unique sound of funk 'n' soul, jazz 'n' rock classics. 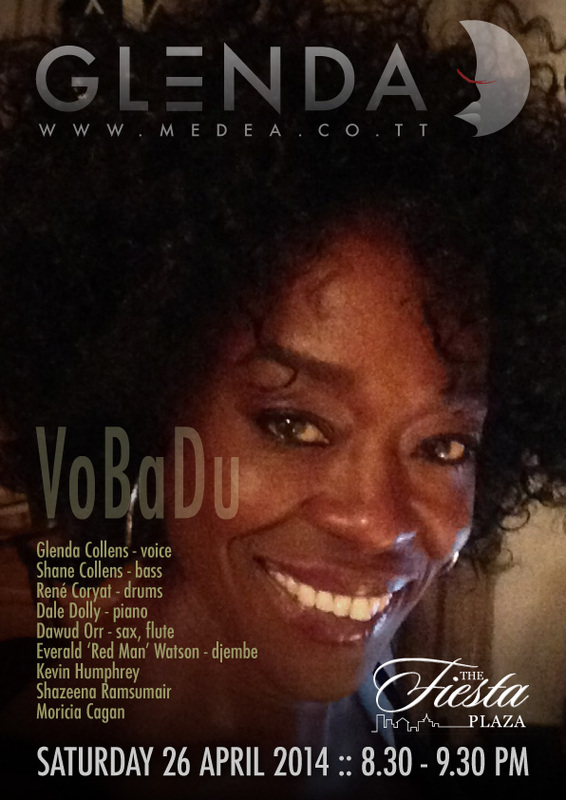 MEDEA The Band will be Glenda Collens (vocals/piano), Shane Collens (guitar), Rene Coryat (drums), Vanessa Aberdeen (bass) annd Wayne "Lion" Osouna (djembe). Glenda Collens returns to the "Women in Jazz" series for 2012 at the The Courtyard, Fiesta Plaza, Movietowne accompanied by her band MEDEA with their unique sound of funk 'n' soul, jazz 'n' rock. 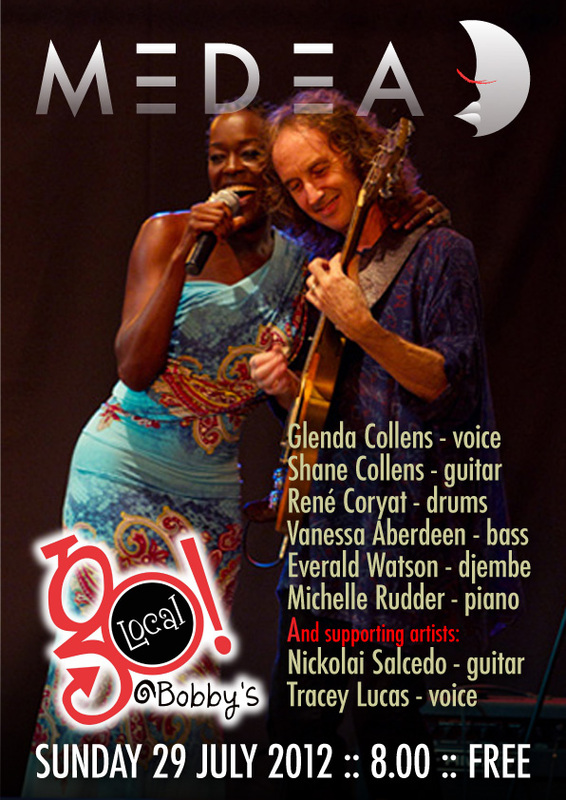 MEDEA The Band will be Glenda Collens (vocals/piano), Shane Collens (guitar), Rene Coryat (drums), Wayne "Lion" Osouna (djembe) and introducing Vanessa Aberdeen (bass).